From the top 25 to the teams fighting to stay out of conference cellars, this is SI's not-so-analytical ranking of every team in college hoops. The great joy and the ultimate frustration of each college basketball season lies in the information overload. With hundreds of games every weekend setting the tone for 32 different conference races and building toward the selection of 68 teams to play for a national championship, it is impossible to process every significant event that happens on the hardcourt between mid-November and early April. That has led to the rise of several statistical databases, ratings systems and performance metrics designed to distill the lessons of each game into a digestible format. Those tools may be finely tuned and authoritative, but no one number tells the story of an entire season. That’s why we set out on an ambitious project this year. Like we do every year, SI’s editors set out to project the top 25 teams in the nation entering the 2018–19 season. Then we expanded the projections out—way, way out—to include the other 328 teams in Division I, from bluebloods like Indiana and Arizona to the two new arrivals to D-I, North Alabama and Cal Baptist. Without the benefit of a comprehensive projections model, we looked at each team’s returning production, multi-season trajectory and notable newcomers to assemble a full-field ranking of every team that might play a role, however small, in determining the 2018–19 national champion. 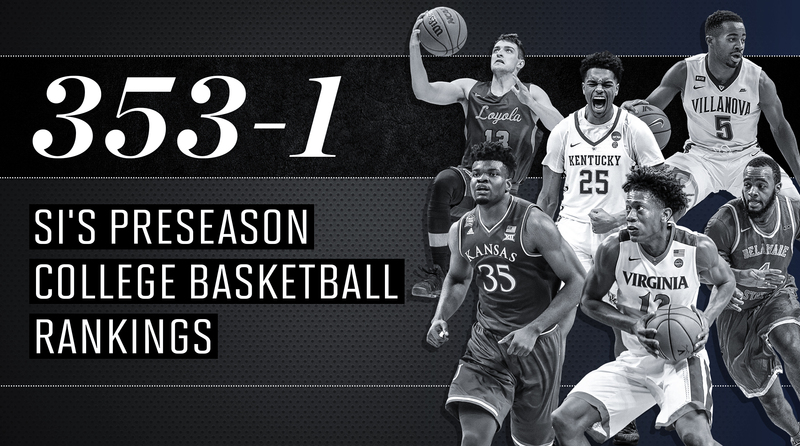 Below are the results, with insights and information on the SI preseason Top 25 and dozens of notable teams on the outside looking in. The notes on SI’s preseason Top 25 were written by Dan Greene and can be found in the Nov. 5, 2018 issue of Sports Illustrated. Molly Geary and Eric Single wrote the breakdowns of Nos. 26–353. 1. Kansas (1st in Big 12): Junior transfer Dedric Lawson, a 6' 9" forward who scored 19.2 points per game for Memphis in 2016–17, will team with 7-foot junior Udoka Azubuike (13.0 ppg) to give the Jayhawks the inside scoring they lacked on last year’s Final Four team. 2. Kentucky (1st in SEC): John Calipari’s best squads have blended freshman talent (three top 15 recruits) with veterans—such as grad transfer Reid Travis, twice a first-team All-Pac-12 forward at Stanford—just as these Wildcats will. 3. Duke (1st in ACC): As the blue-chip newbies develop, 6' 11" junior center Marques Bolden hopes to overcome two years of knee trouble and become the post anchor he was projected to be in ’16, when he was the 11th-ranked recruit. 4. Gonzaga (1st in WCC): Expect to hear a lot about Rui Hachimura, a 6' 8" junior who averaged 11.6 points and 4.7 boards in just 20.7 minutes last season and starred for Japan during FIBA play in September. 5. Tennessee (2nd in SEC): Forwards Grant Williams (15.2 ppg) and Admiral Schofield (13.9 ppg) will give coach Rick Barnes’s Vols enough seasoned talent to make a Final Four run. 6. Nevada (1st in Mountain West): Along with the return of the 6' 7" Martin twins, the practically positionless Wolf Pack get a boost from five-star 6' 11" freshman forward Jordan Brown, the most highly touted signee in program history. 7. Virginia (2nd in ACC): Despite a historic first-round loss as a No. 1 seed, don’t look for the Cavaliers, led by the junior backcourt of Ty Jerome (10.6 ppg) and Kyle Guy (14.1 ppg), to abandon their Pack-Line ways. 8. North Carolina (3rd in ACC): Top-five recruit Nassir Little, a 6' 6" small forward, joins seniors Luke Maye and Cameron Johnson to give the Tar Heels as formidable a front line as any in the nation. 9. Villanova (1st in Big East): The defending champs lost four of their top five minutes leaders, but bucket-minded 6' 8" senior forward Eric Paschall (10.6 ppg, 5.3 rpg) will assume a larger role. Five-star freshman Jahvon Quinerly will be thrown into the fire at the point. 10. Michigan State (1st in Big Ten): Burly 6' 8" big man Nick Ward’s defense has improved, meaning his efficient offense (96th percentile nationally) can stay on the floor more than 18.9 minutes per game. 11. Auburn (3rd in SEC): The Tigers welcome back 6' 11", 260-pound center Austin Wiley (8.8 ppg, 4.7 rpg in 2016–17), who sat out last season after the NCAA ruled him ineligible because of his connection with the FBI probe. 12. Kansas State (2nd in Big 12): Senior 6' 3" guard Barry Brown Jr. ranked among the top three in the Big 12 in steal rate the last two seasons, and his outside scoring ability (15.9 ppg) pairs well with the inside work of 6' 8" center Dean Wade (16.2 ppg). 13. West Virginia (3rd in Big 12): Redshirt 6-foot freshman Brandon Knapper is the likely heir to four-year starter Jevon Carter at the point. A trio of talented forwards presents plenty of passing options. 14. Florida State (4th in ACC): Four seniors—including fifth-year forward and top returning scorer Phil Cofer (12.8 ppg)—give the Seminoles a battle-tested starting lineup. 15. Virginia Tech (5th in ACC): After consecutive first-round exits, Buzz Williams has his best squad of small-ball Hokies yet, with 6' 5" sophomore wing Nickeil Alexander-Walker poised to break out. 16. Oregon (1st in Pac-12): Bol Bol—Manute’s 7' 2" son, with a capable jumper—is the most intriguing of three top 50 freshmen joining the Ducks, who will look to senior PG Payton Pritchard (4.8 apg, 41.3% 3FG) for a steadying hand. 17. LSU (4th in SEC): Sophomore point guard Tremont Waters, one of the country’s most underrated playmakers, gets heralded running mates in forwards Naz Reid and Emmitt Williams. 18. Michigan (2nd in Big Ten): The Wolverines will need more performances like the one they got from 6' 6" junior guard Charles Matthews during the Big Dance (16.6 ppg, 53.2% FG in five victories) to repeat as Big Ten tournament champions. 19. Mississippi State (5th in SEC): Alongside the brothers Weatherspoon (6' 4" senior Quinndary and 6' 2" sophomore Nick), the Bulldogs have a top-notch shot-swatting tandem in 6' 11" sophomore Abdul Ado (1.9 bpg) and 6' 10" senior Aric Holman (1.8 bpg). 20. Purdue (3rd in Big Ten): Junior guard Carsen Edwards (18.5 ppg in ’17–18) will make the leap to national POY candidate—and as the lone returning starter, his every explosive, aggressive basket will be vital if the Boilermakers are to challenge for the Big Ten title. 21. UCLA (2nd in Pac-12): Despite the team’s spate of preseason injuries, 6' 8" wing Kris Wilkes and 6' 3" playmaker Jaylen Hands—both sophomores—should help the Bruins make their third straight trip to the NCAA tournament. 22. Syracuse (6th in ACC): Their maddening 2–3 zone and five returning starters—featuring 6' 6" junior guard Tyus Battle (19.2 ppg)—could have Jim Boeheim eyeing his 20th Sweet 16. 23. Florida (6th in SEC): His efficiency dipped when he took on a smaller offensive role in ’17–18, but 6' 2" senior guard KeVaughn Allen will get a boost from 6' 5" freshman Andrew Nembhard. 24. Clemson (7th in ACC): Last year’s expectation-defying 14–1 start and Sweet 16 finish was powered by a top 10 defense; with 6' 9" senior Elijah Thomas (10.7 ppg, 8.1 rpg) back as an anchor, an encore is within reach. 25. Loyola-Chicago (1st in Missouri Valley): More than a one-March wonder, seniors Clayton Custer (45.1% 3FG) and Marques Townes (38.7% 3FG) and the rest of the guard-centric lineup will shoot the Ramblers to continued relevance. TCU (No. 26) was one of the best ball-sharing teams in the country a year ago (the Horned Frogs' 18.6 assists per game were second only to Michigan State), and junior Alex Robinson and senior Jaylen Fisher will team up in the backcourt to keep the offense humming even after the departures of scoring centerpieces Kenrich Williams and Vladimir Brodziansky. Can Tim Miles take Nebraska (No. 27) back to the tournament for the first time since 2014, his second season in Lincoln? Another NIT trip would be tough to swallow for the Cornhuskers' senior core. Washington (No. 28) ran hot and cold in its first year under Mike Hopkins, but the Huskies got encouraging returns from their immediate buy-in to Hopkins's zone defense, and both forward Noah Dickerson and guard Jaylen Nowell have a chance to finish among the Pac-12's top five scorers. The final season of The Ethan Happ Show promises to be must-see TV: The versatile forward led Wisconsin (No. 29) in points, rebounds, assists, blocks and steals last season, the first Big Ten player to do so in 22 years. With Collin Sexton off to the Cavaliers, the next Alabama (No. 30) freshman everyone will be talking about is five-star point guard Kira Lewis, the youngest player in Division I, who reclassified from the class of 2019 and will join John Petty and Dazon Ingram in the backcourt. Lewis doesn't turn 18 until Final Four Saturday. Offense is the name of the game for Markus Howard and sharp-shooting Marquette (No. 31), but the key to making the jump from last year’s NIT berth is an improvement defensively. Indiana (No. 33) is one of the nation’s most intriguing teams, with five-star freshman guard Romeo Langford able to complement returning senior star forward Juwan Morgan and provide the offensive boost that was lacking in 2017–18. Bruno Fernando and five-star freshman Jalen Smith will give Maryland (No. 36) an excellent starting frontcourt, but this is still junior point guard Anthony Cowan’s show. Vanderbilt (No. 38) will need big things from its pair of five stars, Darius Garland and Simi Shittu, to compete in the SEC, but don’t sleep on returning sophomore guard Saben Lee. St. John’s (No. 42) is in prime position to get to its first NCAA tournament under Chris Mullin behind the talented backcourt duo of Shamorie Ponds and Auburn transfer Mustapha Heron. Western Kentucky (No. 44) features its own Tigers transfer in Desean Murray, who paired with five-star big man Charles Bassey makes the Hilltoppers the preseason favorite in the C-USA. Ed Cooley seems to always find a way lately to get Providence (No. 46) to the tournament, and Alpha Diallo will lead that on-court push this year. It’ll be an interesting season for Arizona (No. 49) after the Wildcats lost their entire starting five, but Sean Miller has something to work with in freshman Brandon Williams, ex-Duke transfer Chase Jeter and a group of role-playing returners. Louisville (No. 50) is happy to start fresh under Chris Mack, whose NCAA tournament success at Xavier should carry over to the Cardinals—just maybe not quite this year. The talent maximization skills Chris Holtmann honed at Butler will be put to the test in year two at Ohio State (No. 51), with offensive pace-setters Keita Bates-Diop and Jae'Sean Tate off to the pros and a lot on the shoulders of senior C.J. Jackson and grad transfer Keyshawn Woods. Travis Steele leads Xavier (No. 52) into life after Chris Mack, having dipped into the grad transfer market for two big men (Zach Hankins and Ryan Welage) and a guard (Kyle Castlin) to help combat attrition that threatens to send Xavier back into the Big East peloton. Missouri (No. 57) took a last-minute nosedive in these rankings with the news that sophomore forward and leading returning scorer Jontay Porter tore his ACL and MCL in a secret scrimmage against Southern Illinois. All eyes are on McKinley Wright as (No. 60) Colorado's sophomore guard looks to build off an electric debut season in which he smashed Chauncey Billups's school mark for assists by a freshman (175). (No. 65) Marshall's red-hot March has brought freewheeling coach Dan D'Antoni and his sharpshooters Jon Elmore and C.J. Burks some well-deserved national attention as they line up a run for the very gettable Conference USA title. Watch for BYU (No. 67) to replace St. Mary's as Gonzaga's primary foil in the WCC, especially once fiery guard Nick Emery returns after the first nine games of the season from a suspension in the wake of allegations he accepted improper benefits. The WAC, once again, appears to be (No. 70) New Mexico State's to lose—now it's up to head coach Chris Jans to get the Aggies their first tournament win since 1993. Saint Louis (No. 72) plays excellent defense and returns four of its top six scorers, a perfect recipe to make the Billikens an A-10 dark horse. In the loaded SEC, South Carolina (No. 75) runs the risk of getting lost in the shuffle with its defense-first approach, but two of the frontcourt starters from the 2016–17 Final Four team, junior Maik Kotsar and senior Chris Silva (last year's SEC co-defensive player of the year, won't back down from the league's marquee stars. Harvard (No. 78) has had a three-season absence from the NCAA tournament, but a healthy Bryce Aiken teaming with Seth Towns and Chris Lewis is a trio that should power its way atop the Ivy League. It could be a big year for Boston-area mid-majors, as Northeastern (No. 79) and its backcourt pairing of Vasa Pusica and Shawn Occeus are our pick to win the CAA. With Trae Young gone, Oklahoma’s (No. 81) rebuild resumes behind Christian James, Brady Manek and Co. Speaking of rebuilds, UConn (No. 84) enters a new era under former Rhode Island coach Dan Hurley, but still has senior star Jalen Adams. Don’t expect Wichita State (No. 87) to be the Shockers team you’re used to seeing; with its senior-laden roster plus point guard Landry Shamet gone, it’s up to Markis McDuffie to pick up the slack. Seton Hall (No. 94) also lost plenty of senior talent, but junior Myles Powell could break out even more this year after averaging 15.5 points as a sophomore. Belmont (No. 89) and Murray State (No. 99) are always a treat to watch compete for the OVC crown, and we expect a similarly tight battle this year. UNC Greensboro (No. 102) was deadlocked with Gonzaga in the final 30 seconds before coming up just short of a hard-earned first-round NCAA tournament upset. Eastern Michigan (No. 103) is on a mission with three double-digit scorers (Elijah Minnie, Paul Jackson and James Thompson IV) back for their senior years. The Spartans are still the class of the SoCon, paced by Spanish senior guard Francis Alonso. It will be hard to focus on Penny Hardaway's first season at the helm of Memphis (No. 110) without thinking ahead to the recruiting advances the school legend has already made in his short time in the college ranks; senior scorer Jeremiah Martin (whose 18.9 points per game were second-most in the AAC) will lead the team until reinforcements arrive. The Big West looks to be just as crowded as it was last season, when two games separated the top four teams. Tournament champ Cal State–Fullerton (No. 118) brings back four starters, including the league's leading scorer Kyle Allman (19.5 points per game). But our money is on UC Irvine (No. 104), which finished third last season without a single senior in the rotation, to put it all together and rise above the fray. Led by senior guard Garrison Mathews, Lipscomb (No. 111) has the weapons to build off its first tournament trip with its first outright A-Sun regular season title. And speaking of fearless scorers, Fletcher Magee and Wofford (No. 122) get to open the season with a rematch against UNC, which Magee stunned last winter with 27 points in an upset of the fifth-ranked Tar Heels in Chapel Hill. Jordan Davis of Northern Colorado (No. 125) is known for the posterizing dunk he threw down during the 2018 Big Sky tourney, but the senior, who averaged 16.3 points last season, is much more than that. Radford (No. 126) is our pick in the Big South to go dancing for the second straight year after bringing back an experienced roster led by Ed Polite, Jr. Northern Iowa (No. 129) is hoping to bounce back after its worst Missouri Valley performance in years, and brings in a top-100 recruit in local four-star A.J. Green. William & Mary (No. 133) could be a dark horse candidate in the CAA behind its hot-shooting style (the Tribe led the nation in three-point and free-throw percentage last year) but needs to find at least a little defense. Expect more high-tempo offense from UIC (No. 145), though the Flames need to cut down their turnovers as they look to challenge in the Horizon League. Louisiana Tech (No. 148) lost a considerable amount of production but would benefit from a healthy DaQuan Brace, a preseason All-Conference USA pick. St. Bonaventure (No. 151) lost top scorers Jaylen Adams and Matt Mobley, which may lead to a precipitous drop down the A-10 pecking order as the Bonnies reload around forward Courtney Stockard. Ball State (No. 158) beat Notre Dame last winter and ran hot and cold the rest of the way, but top scorer Tayler Persons is back for one final year. Rutgers (No. 160) faces less of a gap and more of a crevasse between itself and the next-worst teams in the Big Ten, with a miserable offense that will now be run through sophomore point guard Geo Baker. Defending Big West regular season champ UC Davis (No. 164) should be strong again behind senior guard TJ Shorts II, 2017–18's conference player of the year and newcomer of the year. Northern Kentucky (No. 168) has quickly become a Horizon League factor and will place hope for the program's second ever NCAA tourney bid on senior forward Drew McDonald, who nearly averaged a double double in 2017–18. If anyone challenges Belmont and Murray State in the OVC, our bets are on Jacksonville State (No. 176), which adds a pair of Power 5 transfers in Detrick Mostella (Tennessee) and Ty Hudson (Clemson). Purdue Fort Wayne (No. 178) is known for beating Indiana in each of the last two seasons, and while the Mastodons don’t get a crack at the Hoosiers this year, they do bring back key senior John Konchar. UNC Wilmington (No. 181) is led by senior Devontae Cacok, who averaged 17.7 points and a nation-leading 13.5 rebounds and led the country in field-goal percentage (80.0%) back in 2016–17. The last three MAAC tournament titles have belonged to Iona (No. 188), but the Gaels will have a new look this year and will rely on senior Rickey McGill to get them back to the Big Dance. After bringing back the bulk of its rotation, St. Francis PA (No. 196) is our pick to win the Northeast Conference, and the Red Flash are aiming for their first conference title (and NCAA tournament berth) since 1991. Only a handful of teams in the country had to replace more minutes from 2016–17 to 2017–18 than James Madison (No. 199), and Toledo transfer Stuckey Mosley benefitted most from that void, pouring in 18.4 points per game and setting a brighter course for the Dukes' outlook this winter. The backcourt stars that helped UMBC (No. 204) make NCAA tournament history are gone, and with no one-for-one replacements for Jairus Lyles, K.J. Maura and Jourdan Grant, coach Ryan Odom may lean on his more season frontcourt. Diminutive guard Chris Clemons is the one-man show that powers Campbell (No. 205), back for one last run after leading the country with 24.9 points per game last year. Jeff Capel's first year at the helm of Pittsburgh (No. 206) might not be pretty, but the Panthers pulled in the fifth-best recruiting class in the ACC by 247Sports Composite ratings. When Joe Dooley was first hired by East Carolina (No. 209) in 1995 at the age of 29, he was the youngest head coach in Division I; nearly two decades later, he still holds the program's best career winning percentage mark as he returns to Greenville after fulfilling tough follow-up act to Andy Enfield at Florida Gulf Coast (No. 221). After a third-place finish in the MEAC and an NIT trip, how will the uptempo attack of Hampton (No. 223) translate to the Big South? Hawaii (No. 225) brings back the majority of its roster, including senior guard Sheriff Drammeh, but the group will need to build on last year’s .500 mark in the Big West. It’s looking like another tough year for California (No. 229) and Washington State (No. 247), who take home our lowest spots among Power 5 or Big East teams after a season in which they combined for six Pac-12 wins. UT Rio Grande Valley (No. 235) played with one of the nation’s top-10 fastest tempos last year and should bring more of the same this time, but it’s going to be tough for the Vaqueros to compete in the WAC without a significant improvement in shooting. It’ll be a tall task for Brown (No. 241) to break through in the Ivy League to make its first NCAA tourney since 1986, but the Bears are led by a pair of players (Desmond Cambridge and Brandon Anderson) who averaged 17.3 points a season ago. South Florida’s (No. 246) second year under Brian Gregory is unlikely to get much better after significant roster turnover. New coach Johnny Jones has been left with the aggressive schedule Mike Davis used to test Texas Southern (No. 251) and the expectation that the Tigers will once again be the class of the SWAC. There will be a lot on the shoulders of 7'2" center Trayvon Reed. Albany (No. 258) played Memphis and Louisville to within 10 points in its non-conference schedule last December by crashing the boards, but the loss of top grad transfer Joe Cremo to Villanova will take a lot of bite out of the Great Danes' offense. New Orleans (No. 263) loses three of its four regulars who stood 6'6" or taller from last year's team, which could spell trouble if the youngsters with size require a lengthy adjustment period. After the surprise firing of Scott Cross in March, UT Arlington (No. 266) will be a blank slate for new coach Chris Ogden: Kevin Hervey was the first Mav to be drafted in 36 years, and all but one player (guard Davion Turner) who averaged more than two points last season went out the door with him. Cal Baptist (No. 273), one of two Division I newbies this season, will look to make an early mark in the WAC with the help of four DI transfers, including guard Milan Acquaah (Washington State), forward Mike Henn (UC Davis) and center Zach Piriog (Omaha). LIU Brooklyn (No. 275) made a surprise run to the NCAA tournament after a fourth-place finish in the NEC and brings back three of its four double-digit scorers. Expect more free-wheeling from Savannah State (No. 282), which led the nation in tempo and three-point rate last season despite ranking among the bottom 10 teams in percentage (30.2%). This is probably the year we see a step back by UNC Asheville (No. 291), which won the regular-season Big South title but welcomes a new coach in Texas assistant Mike Morrell. An improvement on defense saw Southern Utah’s (No. 294) wins total more than double to 13 in Todd Simon’s second season, and for the Thunderbirds to keep the trend going they’ll need a big year from Dwayne Morgan, a former five-star recruit in 2014 who’s wrapping up his career with two years in Cedar City. Cal Poly (No. 299) won just seven games against Division I opponents last season and faces another tough road ahead, but has a senior starting point guard in Donovan Fields. This feels like bad luck: Opponents shot 77.1% from the free-throw line against Sacramento State (No. 302), the second-best opposing mark in the nation. Detroit (No. 316) made its free throws but didn't do much else well in the final days of Bacari Alexander's two-year tenure; well-traveled coach Mike Davis left Texas Southern to engineer turnaround and brought his son Antoine, a 6'1" guard who could make an immediate impact as a freshman. Why, exactly, did CS-Northridge (No. 312) hire Mark Gottfried again? The coach whose tactics have brought NC State into the scope of the FBI's investigation into college basketball will have a long road to relevance with a team that finished alone in last in the Big West a year ago. Bryant (No. 320) is one of three teams that won just three games in 2017–18, and none of those victories came by more than five points, including a two-point win over Mount St. Mary's (No. 323)—the Mountaineers have seven sophomores and a whopping nine freshmen or redshirt freshmen on their roster. One thing The Citadel (No. 329) always has going for it is tempo. The Bulldogs aren’t a good shooting team, but they’ve got no problem getting into an offensive shootout with opponents—more often than not with poor results. Texas A&M-Corpus Christi (No. 332) took a big step back last season after three straight 20+ win seasons and isn’t likely to improve much this year unless it finds more offense. Coppin State (No. 339) and Jackson State (No. 342) will just be hoping to connect more inside the arc after finishing with the country’s two worst team two-point percentages. North Alabama (No. 352) joins Cal Baptist as one of two new Division I teams this year, but is likely ticketed for the cellar in the Atlantic Sun as it gets its bearings. And, finally, our list wraps with Delaware State (No. 353), which went until mid-February last season before picking up a win over a D-I opponent and has a new coach, Eric Skeeters, who was on the sideline as a UMBC assistant during the Retrievers’ historic upset of Virginia.